Back up, Dudes. This girl totally learned how to grill this summer! That’s right, I made fire. I made the charcoal glow. I totally put stuff over it and let it get all warm and crispy. I flexed my inner stud-muffin and grilled the heck out of meats and veggies alike! Did I almost light my hair on fire? Maybe. But you know… there’s always a learning curve. Me + Fire + General Clumsiness = Could have been worse. I think I might make my husband nervous. Even though I told him to back off, and in his attempt to not tell me what to do (because, really…who likes that?) I can see him peeking at me from the other side of our sliding glass doors. Probably best. It’s always good to have a teammate when you set your hair on fire. One person to scream (me) one person to extinguish (him). So… we all have vegetarian friends, right? I know I do. For some reason most of my really close friends are of the non-meat eating varietal. This used to stress me out. Am I allowed to say that? I know, I know, weird right? This coming from the girl who doesn’t eat gluten. Look at that big fat double standard, eh? I’m sure my gluten eating friends totally talk about how frustrating it is to feed me. It’s cool. We make due. I respect you. Let’s all just have a glass of wine. That’s vegetarian. I think it’s even vegan. If we found a bottle of wine in a back alley, that would technically be freegan. Beautiful. I like where this is going. It’s most likely going to end with a lot of exuberant dancing and a headache. I’ve learned to calm my vegetarian freak outs. You guys can totally come over for dinner. I’ve been known to make a really bang-up Eggplant Parmesan. It’s kind of hard to go wrong when you batter and fry eggplant in olive oil and assault it with copious amounts of cheese and wine-laden tomato sauce. I could make love to it. Probably an overstatement, but it feels right when it comes out of my lips. What can I say, I am Italian. I run a little hot. My husband once watched me order Veal Parmigiana for breakfast at an airport. Yup. Normal. Slice dat eggplant, yo. Drizzle it with a little bit of olive oil and sprinkle it with salt, pepper, and granulated garlic. Light your grill. Try not to burn yourself. Wear pants. 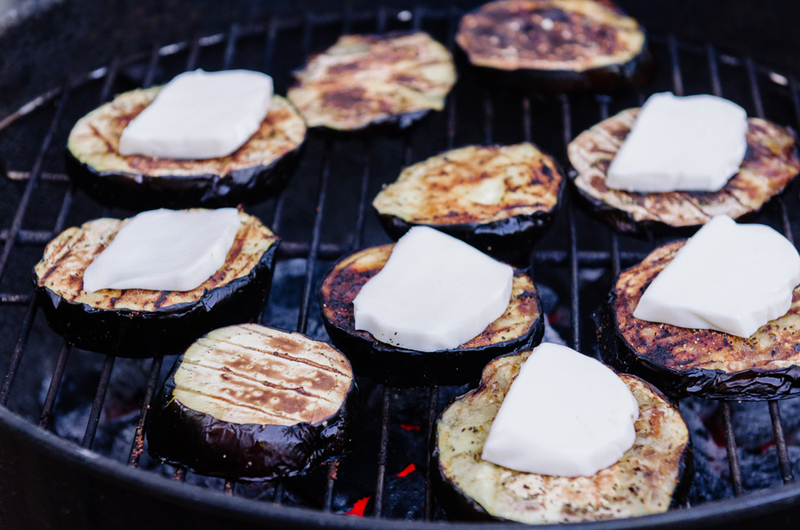 Once your grill is hot, throw on your eggplant slices. Slice up some fresh mozzarella cheese. How could this go wrong? Eggplant, meet Cheese. Cheese, meet Eggplant. Mingle. Stack it up. 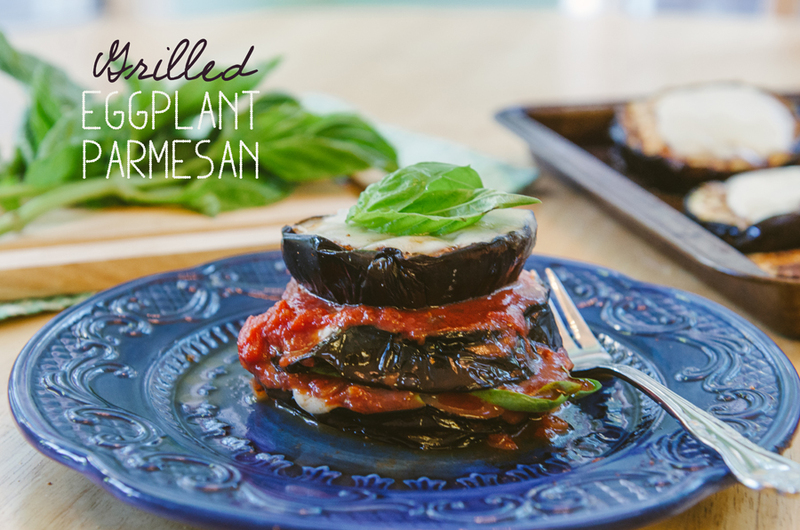 Eggplant, sauce, basil…etc. Now, devour! Can we say vegetarian grilling success? I think so. Enjoy! Light your grill, and allow to heat up to desired cooking temp. 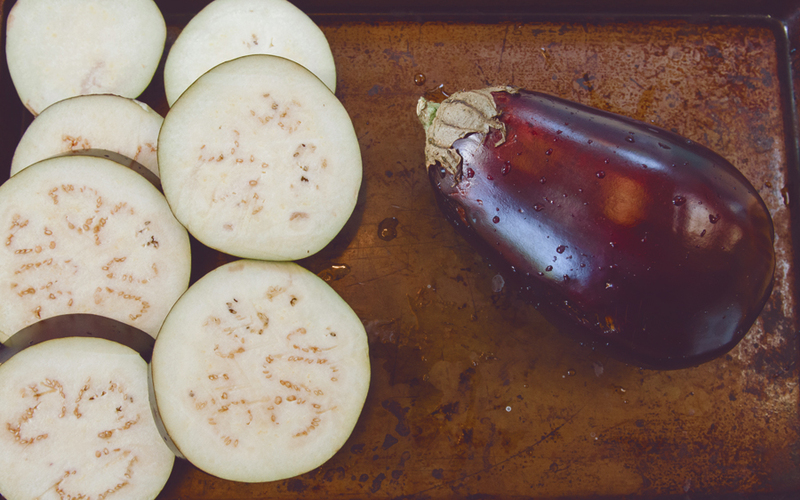 Wash and slice up your eggplants. Make the slices relatively thick, about a 1/2 and inch or so. 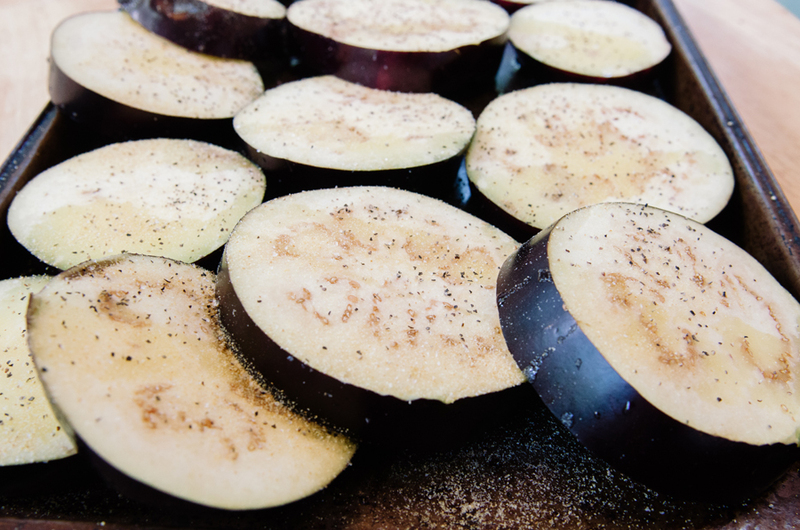 Drizzle your eggplant slices with olive oil and season with salt, pepper and granulated garlic. 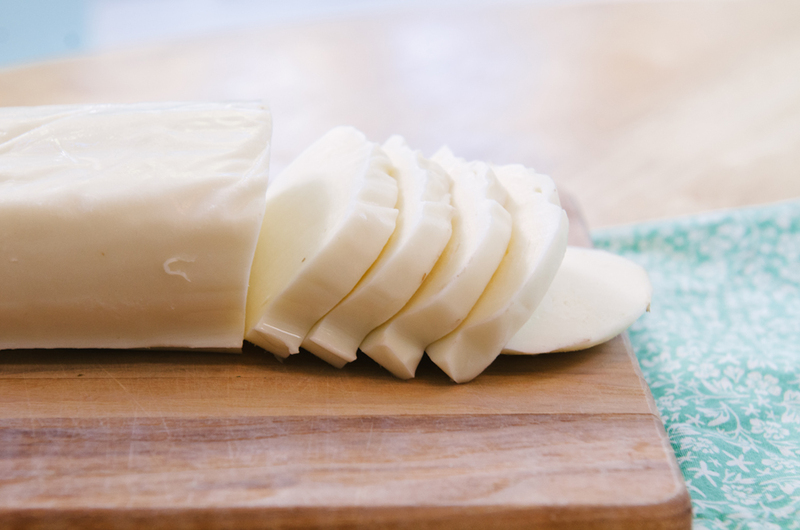 Slice up your fresh mozzarella cheese. 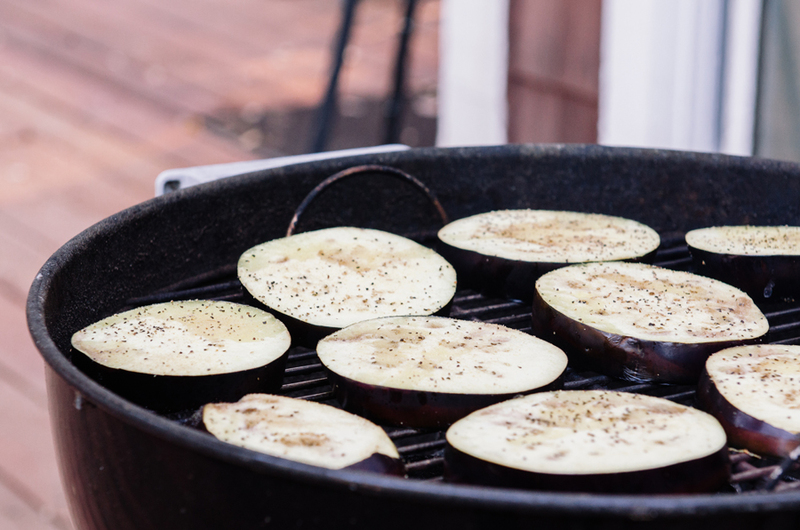 Once your grill is hot, place your eggplant on the grill and cook until it is cooked through. You will see it start to soften and become golden brown in color. It should be relatively soft, and no longer crunchy. Flip eggplant halfway through cooking. Mine took about five minutes a side, but the temp of each grill will vary, so keep an eye on things. 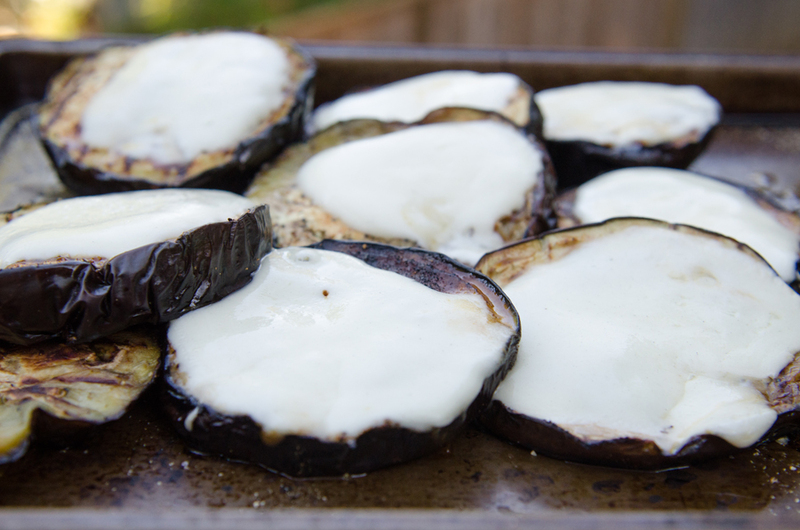 Once your eggplant has been flipped and it is cooking on it's second side, add your cheese. 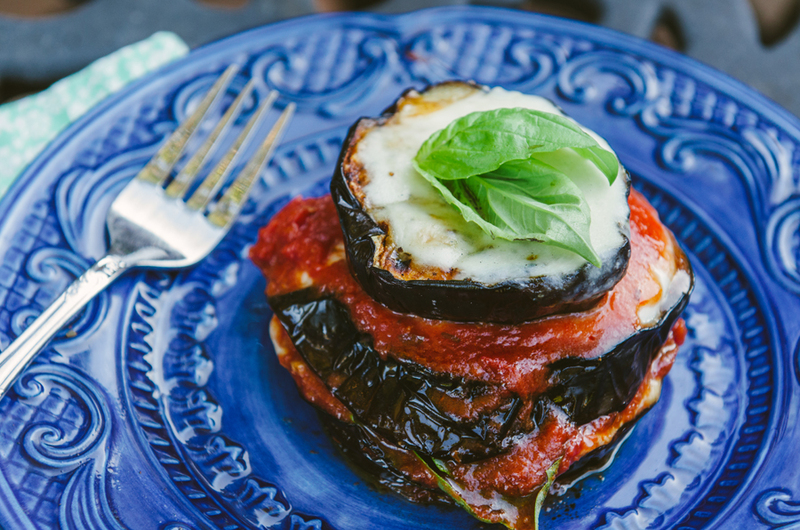 Allow your cheese to melt on top of the eggplant. It is up to you how many slices you wish to put cheese on. It isn't necessary to have cheese on each slice, but it is pretty tasty. Heat up your tomato sauce. 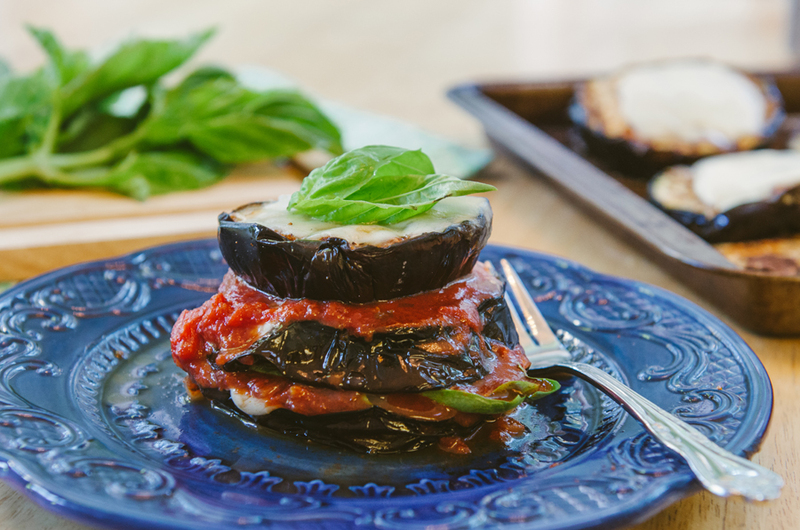 Create your eggplant stack by layering eggplant with sauce and basil and then repeating. If you are feeling crazy, sprinkle some freshly grated parmesan cheese on top. Um YES PLEASE!! I want this in my mouth now! Man I miss cheese sometimes (like right now. A lot!) These are beautiful girl! Thanks, Beth! 🙂 I bet you this would still be delish without the cheese! Can you tolerate goat or sheep dairy? That would be really yummy too. Gina, this looks lovely! Except I don’t have a grill because I live in a studio apartment in a city! But I’m saving some recipes for later. As to wine being vegan – it’s generally not unless it’s a vegan wine. In order to “fine” wine (the process known as fining), winemakers sift the wine through casein (milk), albumin (egg whites), gelatin, and isinglass (fish bladder protein). As a vegetarian, this is fine for me because I still eat the by-products of animals (honey, eggs, milk, etc) but not for my vegan friends. Just a little strange tidbit of information for your day! You just dropped some serious wine knowledge on me! That is crazy. Who would have thought? Thanks for sharing, that’s great to know. So looks so delicious, a healthy way to make one of my favorite dishes. yum!